Palazzo Mango stands in Via delle Scuole, on the corner of Via Vittorio Emanuele near Palermo’s Cathedral and in the ancient area called Cassarello. The name of our Palazzo come from the family of the Marquis Mango di Casalgerardo who used to live there between the 18th and the 19th centuries. The Palace was built in mannerist style; whereas the prospectus, that opens onto Corso Vittorio Emanuele, is neoclassical. The main door in Via delle Scuole is austere and has not been altered by later additions; the windows have straight lintels and gracious balconies. Afterward, some changes have been done in the 3rd floor. Once you enter our main entrance hall, you will find yourselves in a beautiful atrium paved with Billiemi stones, followed by a small open patio with arches. The patio features a staircase adorned with Gothic style arches . The marble staircase ends at the main floor. A smaller stairway runs up to the upper floors. Once in the patio, you can access to a secondary service area which is connected to a second courtyard. The first historical report of our Palazzo, was made by the old historian Vincenzo Di Giovanni in his famous writing Palermo Restaurato (1615 c.a) that stated this way: “una bella casa novamente fabricata dall’Imbastiani”. The Imbastiani was a member of Mastiani, a family of merchants that came from Pisa and moved to Palermo to escape from the Florentines. During the rectification of the Cassaro that began in 1567, a series of general reconstructions started off. Perhaps Paolo Mastiani joined in a single house at least two adjacent buildings: one of them overlooked the Cassaro and the other Via delle Scuole. He levelled and flatten out to the same level both buildings. That’s the reason why today our house has got some steps that in the past used to connect different floors; moreover, the axis of the past separated buildings, were slightly divergent. One of these two houses once belonged to the famous sculptor and architect Antonello Gagini. The façade of our Palazzo reveals the juxtaposition of different buildings; these differences can be seen even in the upper cornices that interrupt right in the middle of the facade. We suppose that once the house was provided with an ancient internal stairway. The restoration of the building may have been committed to the same people who, after 1567, renovated the house of the bookseller Giovan Francesco Carrara, located at the corner of Corso Vittorio Emanuele with Via Alessandro Paternostro. Both buildings have similarities such as the windows and the crowning cornices. During our works of restoration, we discovered some old, beautiful, decorated ceilings and painted beams. The building was renovated in neoclassic style at the end of 1700. The façade was rebuilt in the style that you can now admire. Triangular and curved eardrums were added like in Palazzo Isnello Vito D’Anna as well as some stucco inserts. Also, the stairway the patio and all the interiors had been all restored. At the beginning of our renewal works, we found out that the original ceilings were hidden; we then discovered some astonishing paintings made by the painter Antonino Manno, who was a student and follower of Antonino D’Anna (who decorated the halls of Palazzo Valdina, in our neighbourhood). Manno painted mythological characters such as: Danae, Mercury and Heracles (in the middle of his Apotheosis); the decorations and paintings still have the signature of the painter and the date in which they had been painted which was in 1785. Luckily , the Palazzo escaped the bombs of the Second World War. Many of them destroyed several buildings and the adjacent Monastery of Sett’Angeli especially during the battles between Garibaldi and the Bourbon. 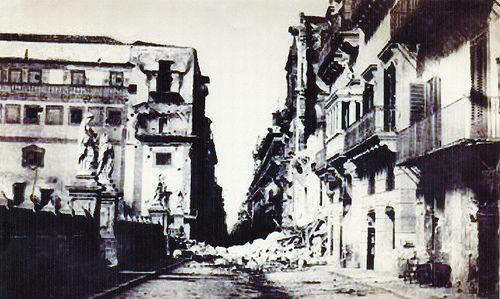 A barricade had been built under its walls to block the Cassaro. After Garibaldi’s conquest of Palermo, his supporter, Francesco Crispi, took his residence in our Palazzo during the expedition of the Thousand (Mille). He then ruled at the head of the Italian Government as today it is shown in a commamorative stone in our façade. During the Second World War, the Palazzo was at the center of some terrible bombings that devastated the city and shaved off the entire Cassaro. But still, there are some buildings such as Palazzo Papè di Valdina and the Biblioteca centrale, that testify its presence. Despite the war, the Palazzo was hit by only one bomb that felt in one of our living-rooms and destroyed the roofs and floors but did not explode. Today this living-room is the only one which has a non-decorated roof. From the 1930s, the main floor of the Palace Mango was used as a public office and had been totally changed. New walls were built,they applied new ceilings, they painted the vaults and the ancient fixtures in white colour , they broke and took off the marble steps. The floors made of ancient potteries were all been removed and replaced. The building felt into a state of abandonment. The Barons Tagliavia Martinez of San Giacomo, came into possession of this property in 1992; They worked to reconstruct and restore the ancient structure, the original spaces and the whole property.